Phillip Hughes: Why does a death in sport hit us so hard? Young men of 25 die every day - in crashed cars, on battlefields, in cancer wards. When it happens in a sporting arena it is no more tragic, but its impact is both more universally felt and somehow far more shocking. Elite sportsmen are our real-time superheroes, capable of physical wonders beyond the rest of us, seemingly unbound by many of the same biological constraints. Watching them can make us feel immune to the real world. Sport becomes our great escape from its darker mortal realities, an alternative playground where the language is one of battles and great victories but from which everyone walks away to fight another day. Its tragedies and losses aren't real, even if the hype would sometimes make you believe they were. So when the illusion shatters, as it has with the death of Australian batsman Phillip Hughes, it is utterly unexpected and difficult to accept. We know there is danger in sport, in repeatedly ducking a hard ball bowled at 90 miles an hour or driving a twitching rocket of a Grand Prix car. It is what fires much of our admiration. It also makes an accident like the one that killed Hughes, or that cost Ayrton Senna his life at San Marino in 1994, all the harder to comprehend. These were ones who were supposed to be invulnerable to the odds, who could flourish where logic suggested it was impossible. We mourn the person and empathise with their families. We also mourn the sporting loss: the World Cups Munich air disaster victim Duncan Edwards could never light up, the races and world titles Senna would never win, the Test centuries Hughes will never score. Because sportsmen's lives are quantifiable in a way that others aren't. They are known to us like friends. They are deaths with statistical eulogies. In the records of races won or goals scored or wickets taken comes an understanding of what they have achieved and what they could have gone on to do. With their premature loss comes bewilderment. 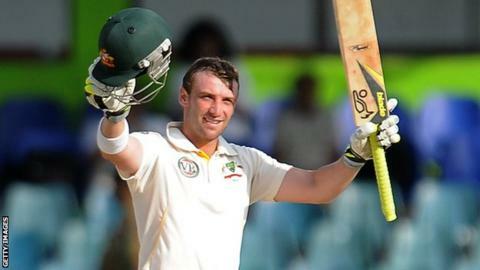 Hughes's final scorecard will forever read 63 not out: a lovely start, not enough, not yet. Cricket, like all other sports, is rich in fables of the miracle comeback or improbable recovery. Hughes himself had been involved in one of its most famous, when his 81 not out in a last-wicket partnership with teenage debutant Ashton Agar almost won his side an unfathomable victory in the first Ashes Test in the summer of 2013. It conditions us to expect the same from its protagonists off the pitch. These men and women are fighters, used to taking on the odds, to cocking a snook at reason and precedent. So it was that when news first broke of Hughes's collapse at the Sydney Cricket Ground, hope spread almost as quickly as the distress. Perhaps the recent tragic accidents to F1 drivers Michael Schumacher and Jules Bianchi, devastating though they have been to both men and their families, have also inured us to the stark medical logic of severe brain trauma. The induced comas of Schumacher and Bianchi slowly, painfully slowly, presaged a partial recovery. Medical experts in Sydney may have feared the worst. Many others, misguidedly, did not. For Sean Abbott, the 22-year-old whose delivery struck Hughes the fatal blow, these will be overwhelming hours. Hughes's death was not Abbott's fault. Neither was Senna's down to Adrian Newey, the chief designer at his Williams team, yet the Briton is still haunted by that calamitous day two decades on. Some of those who have shared his awful predicament have been able to fight their way out through strong logic and the forgiveness of those they hurt. Chris Eubank, a far more intelligent man than his cartoonish public persona suggests, may not have been capable of quite the same ruthlessness in the ring after his fight with Michael Watson in September 1991 left his opponent with permanent brain damage. But neither did he regret the upper cut that put Watson in a coma for 30 days - only its outcome. Why? Because had he not thrown that punch, in a contest that had brought both men close to the edge, he would have failed in his responsibilities as a professional boxer. He was there to fight, just as Abbott was there to bowl. That was the element he could control. The consequences were not. Not everyone is blessed with Eubank's capacity to recover. Ray 'Boom Boom' Mancini was a 21-year-old lightweight world champion when he fought South Korean Duk Koo Kim for his WBA belt in November 1982. A brutal contest ended in the 14th round, when 44 unanswered punches from the American left his opponent on his knees. Kim collapsed in the ring, suffered two blood clots on the right side of his brain and died in hospital four days later. The referee, Richard Green, killed himself the following year. Kim's mother, equally unable to cope, took her own life four months after Green. Thirty years later, it is still the defining moment in Mancini's life. He is still approached by strangers, asking to see the hand that threw the final punch, still has dreams in which he attempts to embrace Kim. "It's still too painful to talk about it," he said in 2007. "I just don't want to keep reliving it. There have been a lot of prayers, a lot of thoughts. But you never get over it. You never understand." For cricket, the trials are likely to come much sooner. Next July, when Australia and England's fast bowlers charge in to the opposition openers on the first day of the Ashes series, how will supporters in Cardiff react if, as happened on the first morning of the 2005 series, a short-pitched ball hits a batsman flush on the head? When Justin Langer and Ricky Ponting were struck at Lord's nine years ago, it was greeted with roars of approval from around the ground. Hindsight has anointed it the moment Australia's all-conquering team knew they were in a fight, a symbolic and physical blow from which they would struggle to recover. That series was no one-off. Australia's thumping Ashes victory last winter was in large part based on Mitchell Johnson's ability to intimidate England's batsman with short, hostile bowling. The West Indies built an era of dominance around the same strategy. Hughes's death was a terrible freak. But its consequences are there for all of us - for his family, for Abbott, for Johnson and other fast bowlers, and for us as supporters, reminded of our own vulnerabilities by someone we supposed exempt from them.